Known most notably as one of the biggest comeback stories of our era, Bethany Hamilton has become synonymous with inspiration. Her story of determination, faith, and hope has resounded in encouragement worldwide. At the age of 13 as a rising surf star, Bethany lost her left arm to a 14-foot tiger shark, which seemed to end her dream career. However, one month after the attack, Bethany returned to surfing and within two years had won her first national surfing title. Bethany’s foundation of faith has been her backbone; her source of truth, hope, and strength. At 17 years old, she realized her dream of surfing professionally and she is still an active surf competitor to this day. Bethany has been able to touch a large number of people with her faith message, charitable efforts, and overall spirit. Her greatest joy is being a wife and mother, and she continues to touch and inspire lives globally as a professional surfer, author and motivational speaker. She currently has her own blog on helping others become unstoppable. Bethany gives birth to her second son, Wesley. She releases two new books, premieres her new film, Unstoppable, and wins Best Women’s Video Performance at the 2018 Surfer Poll. Inducted into the Surfer’s Hall of Fame in Huntington Beach, Calif. and honored as SIMA’s Water-Woman of the Year. Takes a third place finish at the Fiji Women’s Pro. Tow surfs Pe’ahi “Jaws” on Maui and is nominated for Women’s Best Performance in the WSL Big Wave Awards. Withdraws her ESPY nomination for Best Female Athlete with a Disability. Bethany gives birth to her first son, Tobias. She speaks at churches and events around the U.S.
Bethany places first at Surf N Sea Pipeline Pro, speaks at the National Prayer Breakfast, and is awarded the Nickelodeon Kids Choice “Favorite Comeback Athlete” Award. She and Adam compete on CBS’s “The Amazing Race,” season 25. 10-year anniversary of the shark attack. Bethany is engaged and married to Adam Dirks. The movie about Bethany’s story, Soul Surfer, hits theaters on April 8, 2011, starring AnnaSophia Robb, Helen Hunt, and Dennis Quaid. Bethany travels around the U.S., France, UK, and Ireland to promote the release. It’s nominated for several awards! Bethany enters her first year of full-time surfing on the Women’s Pro circuit—traveling around the world for competition and training. She places third at the Roxy Pro in Australia. Meetings begin with the Hollywood movie producers for Soul Surfer, the movie. Her non-profit, Friends of Bethany, launches. Bethany’s courageous return to surfing led to her receiving the MTV Teen Choice Award for Courage and ESPN’s “Best Comeback Athlete” ESPY award, among many others. 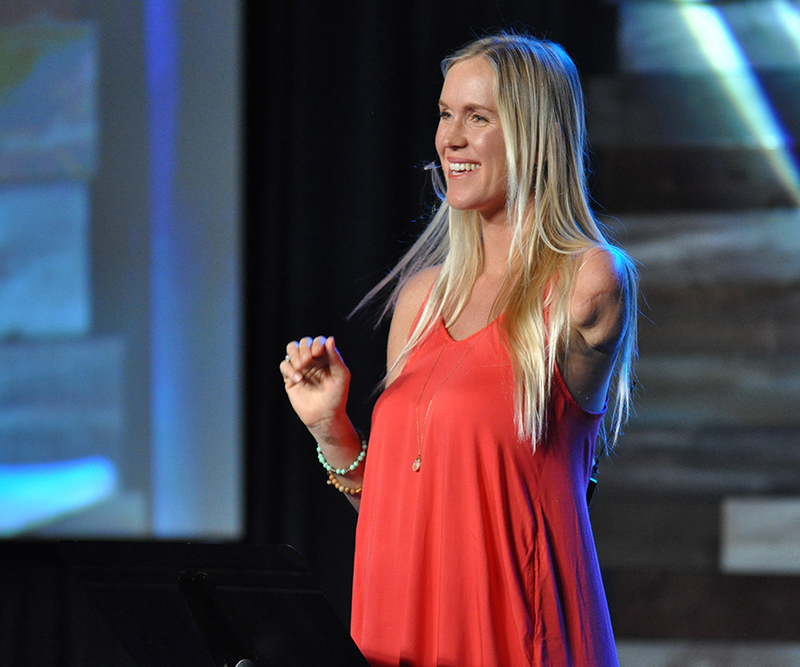 Bethany’s autobiography, Soul Surfer, is published and becomes a best-seller. A year later, she wins the National Surf Championships! A rising surf competitor, Bethany places second at the NSSA National Championships in July. On October 31, she is bitten by a shark and her left arm is traumatically amputated to her shoulder. Only 26 days after losing her arm, Bethany returns to surfing with only one arm, receiving international media recognition. Surfing has been a way of life for Bethany since she was able to get on a board. She sees her passion for surfing as a gift from God and as what compelled her to go back to the sport against all odds. Coming back after the shark attack, Bethany found success in surfing competition; now she makes her mark as a professional surfer in the free surfing arena (chasing waves, getting photos/videos published, and “Living The Search”). She currently competes in choice World Surf League (WSL) tour events, upon invite, and in other special events. In 2016 alone, Bethany’s capacity to inspire reached new heights as she beat a six-time world champion and the top-ranked surfer in the world at a major WSL competition. By overcoming some of the hardest challenges and relentlessly pursuing her passion through faith, she has become one of the leading professional surfers of all time. In 2017, she was inducted into the Surfer’s Hall of Fame. Theatrical Release Date is set for July 12, 2019! Soul Surfer (2011) is the inspiring true story of teen surfer Bethany Hamilton, who lost her arm in a shark attack and courageously overcame all odds to become a champion again, inspiring millions worldwide through the love of her family, her sheer determination, and her unwavering faith in Jesus Christ. The film features an all-star cast, including AnnaSophia Robb and Helen Hunt, with Carrie Underwood in her film debut, and Dennis Quaid. With filmmaker Becky Baumgartner, Bethany produced a documentary entitled Heart of a Soul Surfer (2007) which revealed her heart and personal perspective of her story. The documentary and Bethany’s book, Soul Surfer, served as the inspiration for the screenplay of what would become the theatrical movie, Soul Surfer. Dedicated to helping people live an epic life! Known most notably for one of the biggest comeback stories of our era, Bethany Hamilton has since become synonymous with inspiration. Bethany is a sought-after public speaker. She is motivating audiences worldwide to live their life with more tenacity, courage and faith. Bethany’s story of overcoming obstacles shines with determination, passion, and hope. Bring Bethany’s message of perseverance and triumph live to your audience! Please get in touch through our online form to learn more about bringing Bethany to speak to your group. In the picture book, Be Unstoppable: The Art of Never Giving Up (2018), Bethany inspires readers to be bold, enjoy life, and take the risk of trusting God each day. Alongside breathtaking, never-before-seen photos from the making of her new documentary, Bethany Hamilton: Unstoppable, the book has inspiring quotes and lessons from her life. With a full-color poster included, this book will resonate with new and old fans who will appreciate her story of living life with anticipation for the limitless possibilities found in a faith in God that is bigger than the hardships she faced. Bethany’s children’s book, Unstoppable Me (2018), co-written with her husband Adam Dirks, tells the story of Makana the lion, who loves to surf but loses her nerve when she wipes out. When her friend encourages her to go back out again, Makana summons up the courage and discovers the success that comes from believing in yourself and never giving up. As seen in the credits of feature film Bethany Hamilton: Unstoppable, this playful board book with foiled padded cover will have little ones cheering for Makana and inspire them to stay strong and keep trying, no matter what challenges might come their way. The story is illustrated by Gill Guile. Using her platform as a professional athlete to promote living a fit and healthy lifestyle, Bethany authored the book Body & Soul (2014). While sharing her amazing expertise as a world-class athlete, Bethany helps readers become their healthiest, most confident and joyful selves. Her easy plan is filled with fun workouts, good-for-you recipes, and tips for staying stress free and soulful, even on the toughest of days. Bethany has already lived more than a lifetime’s worth of triumph and tragedy, and she shares every poignant moment in these pages. In Soul Surfer: A true story of faith, family, and fighting to get back on the board (2004), readers learn how she rose once again to the challenges of competition after a life-changing event, how she dealt with the maelstrom of media attention, and how she relied on her faith and innate positive thinking to embrace changes that would undo most people. Written with passion and insight, and filled with thrilling moments of the sport Bethany has come to personify, this is a portrait of American heroism that will captivate readers of all ages. She’s blonde, brave, and totally determined―she’s a gutsy professional surfer who has inspired millions, and her biggest audience is teenage girls. In this devotional, Bethany speaks straight to her soul sisters about letting God lead in the epic ride of life. In this devotional (2011), Bethany shares stories of women to admire, prayers to focus on, and wipeouts to avoid. Girls will hear thoughts on friends, family, faith, gossip, and peer pressure―Bethany covers it all. The Hamilton family’s adventures started long before Bethany lost her arm and became a pro surfer. Cheri Hamilton, Bethany’s mom, tells their inspiring family story. In Clash, a tight-knit group faces a challenge when a new girl with a secret crowds Bethany and her friends. Important heart issues lead to difficult decisions. In Burned, Bethany has a run-in with an unpleasant kid on a surf trip to Samoa and discovers something in the Samoan culture that brings healing and forgiveness. In Storm, Bethany helps a young family lost on the Kalalun trail. As Bethany’s youth group struggles to raise funds for a mission trip, her small act of kindness blesses them all. In Crunch, Bethany meets a little girl at an orphanage in Mexico who must have her arm removed. Concerned by her condition, Bethany makes a promise to the child that threatens Bethany’s opportunity to surf in a prestigious contest.